The price of food and fuel has skyrocketed beyond our reach because of a blockade on the roads into the state. For three months two different groups have blocked the main highways, preventing deliveries of essential commodities and medicines. A kilo of potatoes which was Rs. 15 (18p) before the blockade is now Rs. 40 (50p) a kilo. What we can’t get in the shops has all shifted onto the black market. An LPG (liquid petroleum gas) cylinder which is priced at Rs. 420 (£5.28) now costs up to Rs. 2000 (£25.16) on the black market. Manipur is like a bowl: a small valley area surrounded by hills. As the state’s own produce is insufficient to meet the requirements of the people, we rely on imports from outside the state, especially petrol, LPG, rice, pulses and other essential commodities. The blockade has made life very hard for us widows as we are running our families single-handedly. HIV-positive widows suffer the most as ART (antiretroviral therapy) drugs are running short. Besides ART drugs, many other drugs prescribed by doctors are no longer available on the market. The rich will not feel the pinch but for us widows and our children, it is a kick to our stomach. The main group behind the blockade is the Sadar Hills District Demand Committee (SHDDC), which began its indefinite protest three months ago. 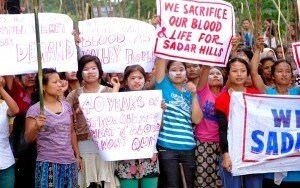 They are demanding that the Sadar Hills sub-division be upgraded to division status. The United Naga Council, which represents one of the major ethnic communities in the state, has launched a counter-blockade on all three national highways, claiming the SHDDC demand would affect Naga land. All this has not only affected the supply of food and other essential items in the state, but also strained the relationship between the communities. A multi-ethnic society has its own set of advantages and problems. 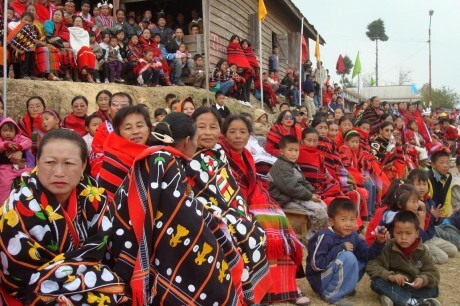 Manipur has around 35 ethnic communities living together within an area a little over 20,000 square kilometres. There is much we can learn from each other, yet it also means that there are many thin lines that we have to be careful of, as human aspirations and demands often overlap and interweave. Manipur has been witness to such conflicts, especially in the last two decades, in which thousands of people have died as a result of violent clashes between ethnic communities. At present, Manipur has nine districts of which four are in the valley area (roughly one-tenth of the state’s geographical area) and five in the hills. For many years now, there have been various calls for a reorganisation of the district administrative units and formation of new ones. On one hand, the creation of new districts sounds like a good idea as it might facilitate administration and bring about equal development in both the hill and valley areas of the state. During gender sensitisation programmes that I have conducted in the remote villages of Senapati and Tamenglong, I witnessed myself the hardships and underdevelopment in these areas. People there are unaware of government benefits and schemes that could help them. But the solution is not as simple as it seems as there are many stakeholders whose consent is required in a decision. At the same time we cannot help fearing that if the impasse continues and if the government fails to control the situation and bring about an understanding soon, there might be reoccurrence of past violent conflicts. So far, four people have died and many trucks loaded with food and medicines have been burned during the ongoing agitations. Recently, I called a press conference along with a group of widows where we spoke about the impact the blockades and counter-blockades are having on us. Though the impasse has hit every section of the society, women whose husbands have passed away due to conflict or HIV/AIDS are perhaps the worst affected. Yet, at the same time, we have to restrain ourselves from any kind of whiplash reaction. I have received training on conflict transformation given by my NGO, so I have to restrain not only myself but also ask everyone I come in contact with to keep calm. You see, due to our bloodstained history, it is very crucial that we think a thousand times before swinging into action. We are living in a very fragile peace which threatens to break every now and then as the aspirations of the major communities living here – the Meitei, Naga and Kuki – are different. The Nagas want to reintegrate its people who were spread across various northeastern states, as well as Myanmar, during the formation of the India in 1947. The Kukis, who are also similarly distributed, also want to live together. On the other hand, the Meitei who form the majority community in Manipur are against the breaking up of the state. So there is always tension in the air, with the communities blaming each other, while the government sits on the fence watching instead of trying to find a long-term solution.